Beat warned me that my Freedom Challenge report is delving too far into the negative aspects of my experience. I didn't mean for it to come across that way — to sound as though I spent the entire trip stressed and frightened. There were many relaxing and enjoyable moments that tend to fade in the wash of memory, while the sharp edges of the more intense experiences stick out. Those sharp edges are why I pursue endurance racing. I seek to not only learn more about what lies beneath my perception of the world and myself, but also to gain more control over these perceptions. I'm a fearful person. Maybe more so than others, and maybe not, but fear has always lurked around the edges of joy. I'm not brave, and I'm not strong ... but I'd like to be. So what do I do about it? I face my fears. I push my limits. This process is always hard and sometimes painful, and many, many mistakes are made ... but ultimately, I emerge with a richer perception of the world, which is useful in smothering fear. I knew, going into the Freedom Challenge, that I had a deep fear of being lost. I came here to face that fear. I did what I thought would help me in preparation — reading orienteering books, studying the race maps, practicing with trail maps at home. But in practice, facing this fear was much harder than I expected it to be. I was in a foreign, unfamiliar land. Trails weren't laid out in familiar ways; roads were devoid of signs. The phantom night would haunt me. Panics would seep through my determination, shutting out rational thought. This internal difficulty is what I am trying to convey in these writings. Conveying the emotion of an experience is different than conveying its objective reality. In reality, Liehann and I were having a nearly flawless race. Yes, there were some mechanicals, some minor injuries, a wrong turn here and there. But the weather was almost perfect — except for a few days of harsh wind — and we made good time on the move. We worked well as a team. Although luck played a part, there were no major navigational mistakes. Most of our gear was working well for us. There was no rational reason for me to be so upset; when I was, it was because of fear. Now I'm going to post about three days when I succeeded in banishing my fear, at least most of the time. These were "easy nav" days, it's true. They were also long, physically demanding, occasionally tedious, energy draining days — all things that are much easier for me than facing fear. In many ways, they were the most relaxing days of the journey. They were also some of the most beautiful. I took a lot of photos that were — as photos often are — incredibly disappointing. They didn't begin to convey the stunning colors, the sweeping expanses, the sweet air and strange sounds of the landscape. We left Cambria at 5 a.m., and I was buzzing with excitement. 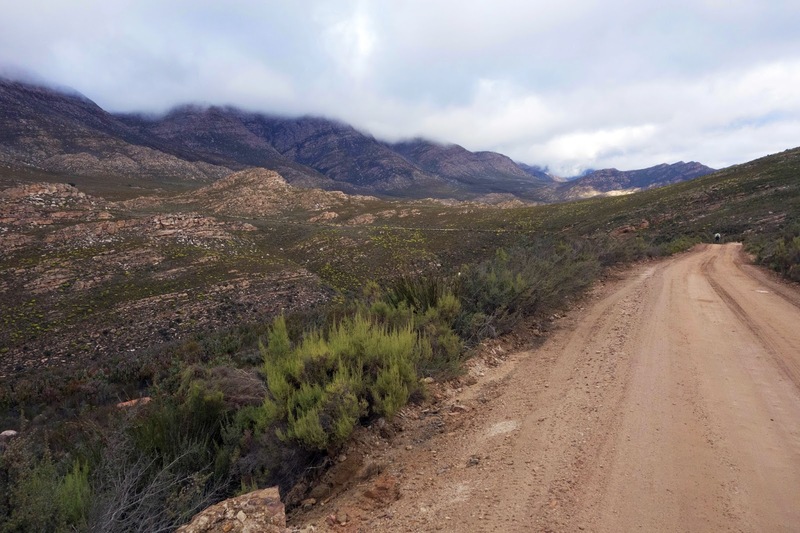 Some of that energy sparked from relief that we'd survived the Osseberg, and some was anticipation for the day we had planned — 106 miles with 13,000 feet of climbing across the Baviaanskloof Nature Reserve. 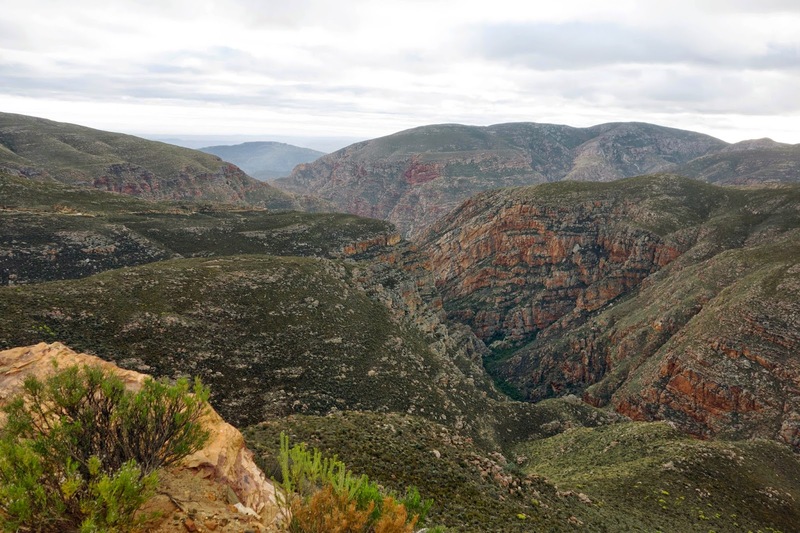 I've never been to a place quite like the Baviaanskloof. The closest parallel I can think of is Zion National Park in Utah. 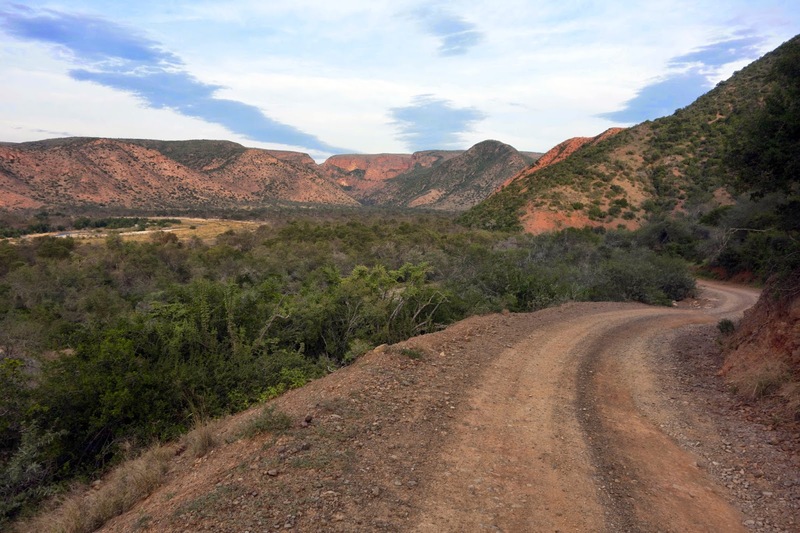 There were intriguing new geologic phenomenons around every turn, kudu wading through the streams across the road, baboons peering out from the bushes, a warm breeze (that developed into a more fierce wind later in the day) and climb after wonderfully long climb. My energy felt almost boundless, and riding my bicycle was a gift. "Every day is a gift," I reminded myself. This was becoming my personal mantra for the Freedom Challenge — "Every day is a gift." 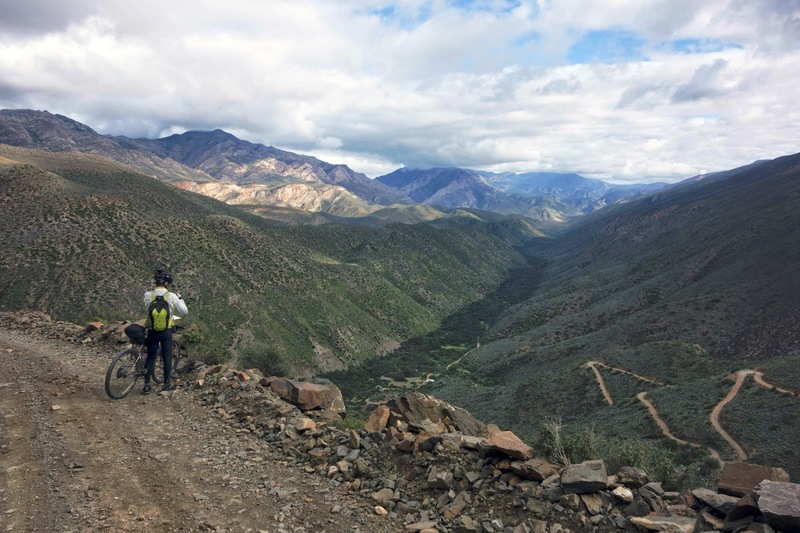 After 81 kilometers, we stopped for lunch in Damsedrif — and I couldn't wait to get back out there. The riding was still difficult, and this day extended well into the hours after dark. We climbed another game fence and rolled along tall brush with all manner of unseen animals rustling branches. I was nervous about buffalo. Rabbits darted across the road, and then I saw a small cat with dark, pointy ears. We weren't all that close to town yet. "Is that a regular cat, or a wild cat?" I asked Liehann. He guessed it was an African Wildcat. We spent the night in Willowmore at a historic hotel. Thirty minutes after we arrived, it started to rain — our timing was impeccable. We enjoyed a gourmet dinner of lamb curry in an ornate dining room. It was a far, far cry from the Osseberg. Marnitz was sleeping there still, and the race leader, Graham Bird, had arrived as well. Graham was going through the following day's maps, of which there were a lot. It was another 162 kilometers to Prince Albert. I couldn't wait. 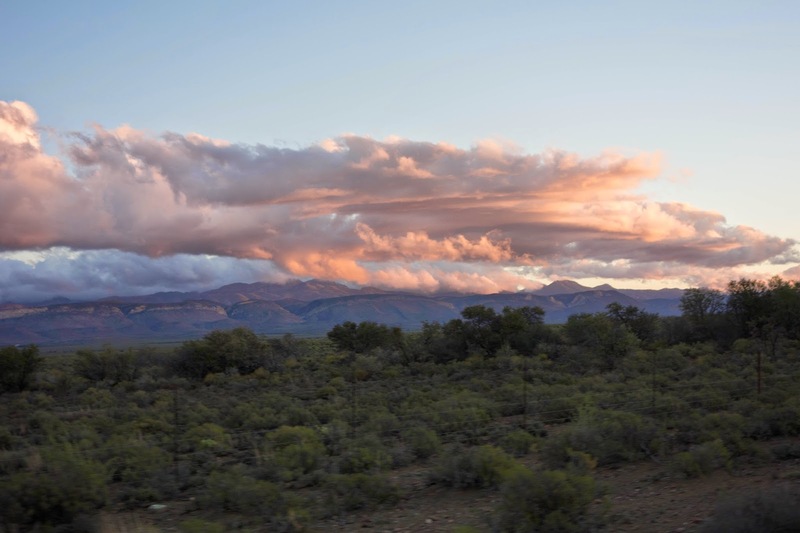 This day would take us back into the high desert of the Karoo, wide-open spaces of rolling terrain that look flat on maps and from afar, but on the ground are anything but. This day, we would greet our old friend, the West Wind. It rushed across the open expanses without mercy, pummeling us in the face with cold air and abrasive sand. By afternoon the wind was easily blowing a steady 25 mph with gusts to 35 mph, and we were lucky if we could hold an 5 mph pace against it. The problem wasn't just the wind, but the road surfaces — swept with soft sand, we'd swerve and stall as we churned forward. Liehann asked if I wanted him to pull, but I was having a difficult time holding my line as it was. "It's not the wind as much as the sand," I said. "I don't think pacing will help much." The constant roar of the wind started to get to me. I put in my earphones and listened to my favorite mix from the Iditarod, which seemed fitting and made me happy. Liehann would ask if I was okay. "This isn't that bad," I said. "This is just tedious. I'm good at tedious." We churned and churned. The wind sapped the energy right out of our legs. Swerving in the sand threw me off my pedals more than once, and my shins were bleeding. Once I nearly pitched over the handlebars at five kilometers per hour. Night fell. For the first time in the entire Freedom Challenge, I welcomed it, because I believed darkness had the power to quiet the West Wind. Rolling in a sea of blackness, we caught a glimpse of an island of lights. Prince Albert was still 25 kilometers away, and only about 200 meters lower than our current elevation. Liehann didn't think we could possibly see town from that far away, but I didn't think it could be anything else. We rode toward those lights for what seemed like hours; visually, it looked like a descent, but we always had to pedal. As long as we were riding we never stopped pedaling, all day. We reached the fancy hotel in Price Albert at nearly the exact same time we'd reached Willowmore — 9:15 p.m.
Marnitz was there, sitting on a couch and drinking red wine. His hair was substantially shorter than it had been last we saw him — a little girl at a farm house offered to cut it. He asked how long it took us to ride into town. Liehann thought about it — not counting the lunch stop, 14 hours. "How long did it take you and Graham? 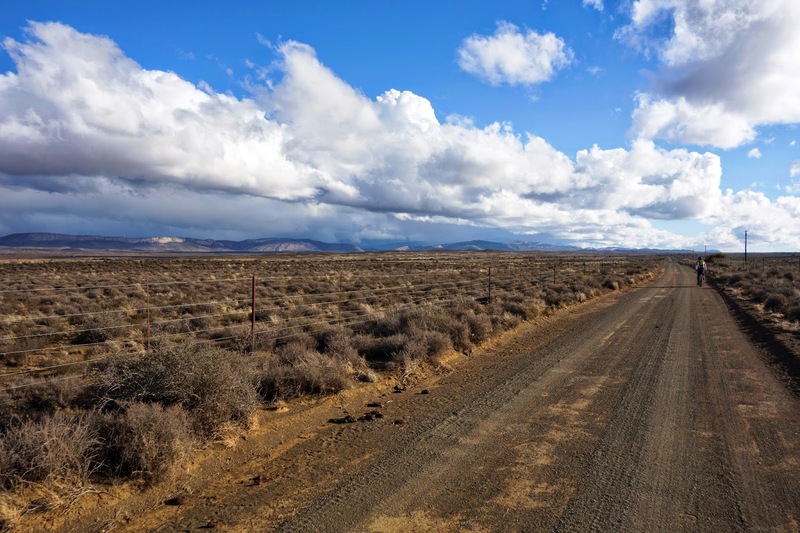 Later, Di would tell us that Graham said that day across the wind-blasted Karoo was one of his hardest on a bike. Whether or not he actually said this, I'm not sure. I didn't think it was too hard. Just tedious. I'm good at tedious. 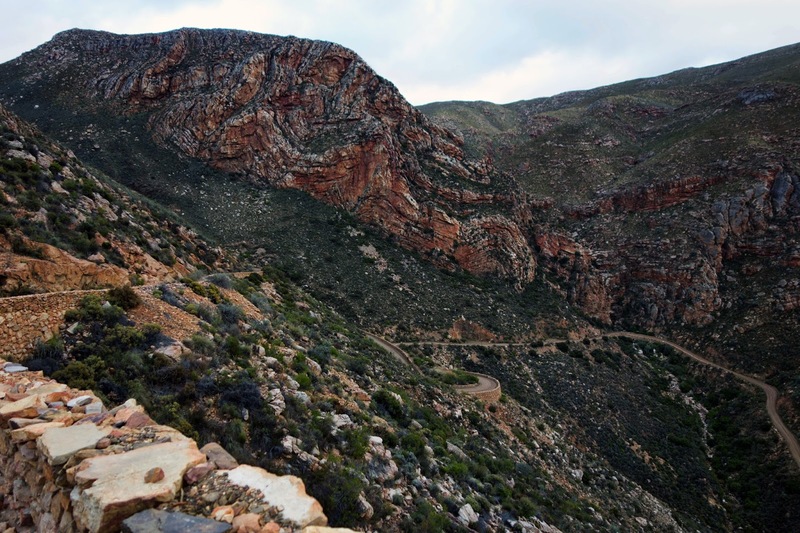 Prince Albert was another nice stop, and our reward the next day was another long climb to Swartberg Pass. The road was narrow, muddy, and empty. If this place were located in California, it would be a National Park as crowded as Yosemite. But instead it's here — isolated, quiet in the winter, sublime. You're probably detecting a pattern here. 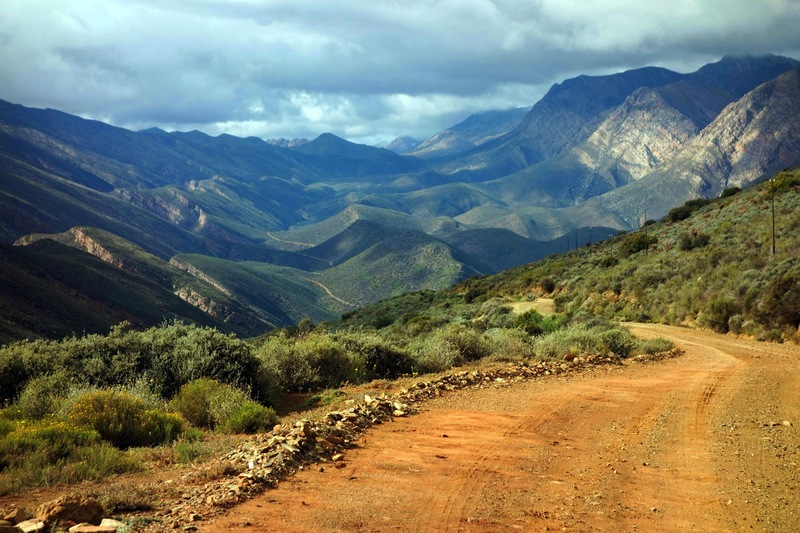 I did love the dirt road touring, especially when it was both scenic and physically demanding. Here, again, is where I have more pictures than story. 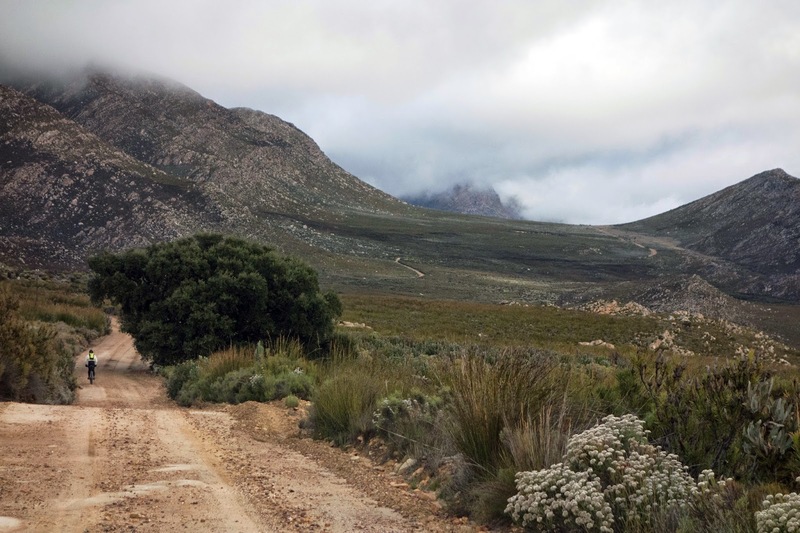 We turned off Swartberg Pass onto the road into Gamkaskloof. 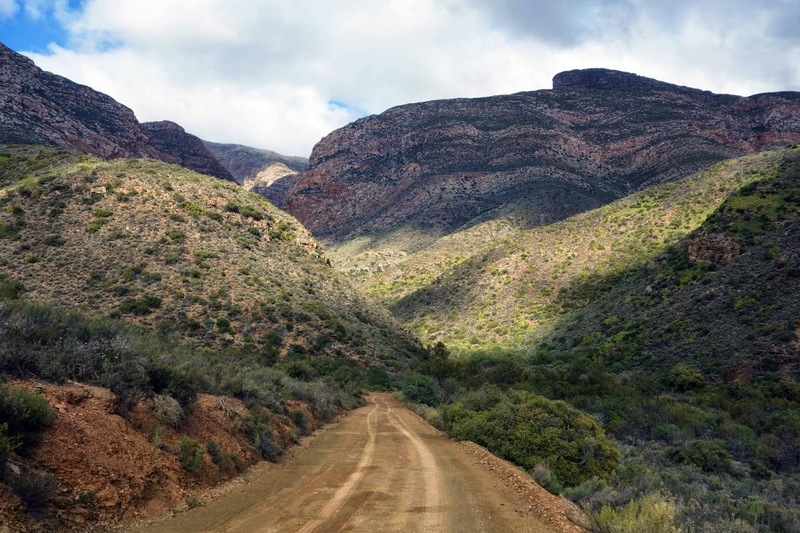 Gamkaskloof is a deep, isolated valley protected by cliffs and an impassable gorge. 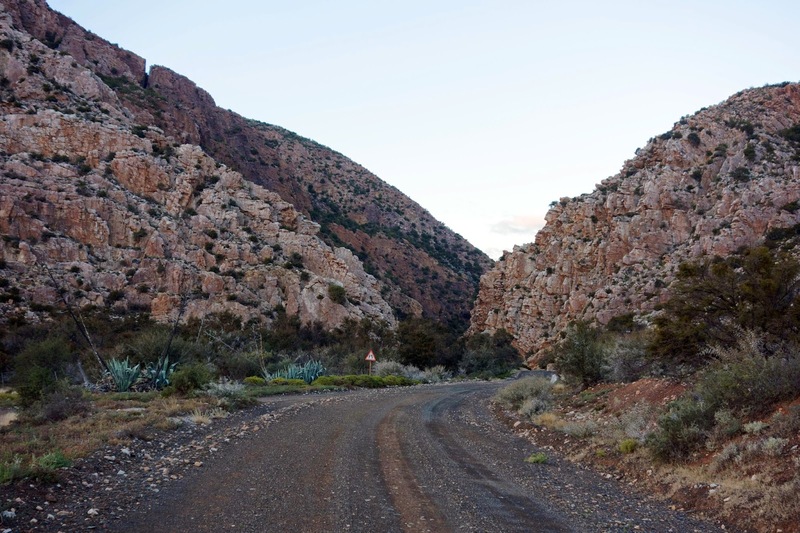 The only way in is a rugged, 37-kilometer dirt road that residents petitioned for in 1962, and that led to the depopulation of the valley. This road is the only way out as well. Well, technically, there is one more way out. This was a fun ride. Lots of steep rollers lined by these imposing mountains. The weather looked threatening, but we only got a few short rain showers. 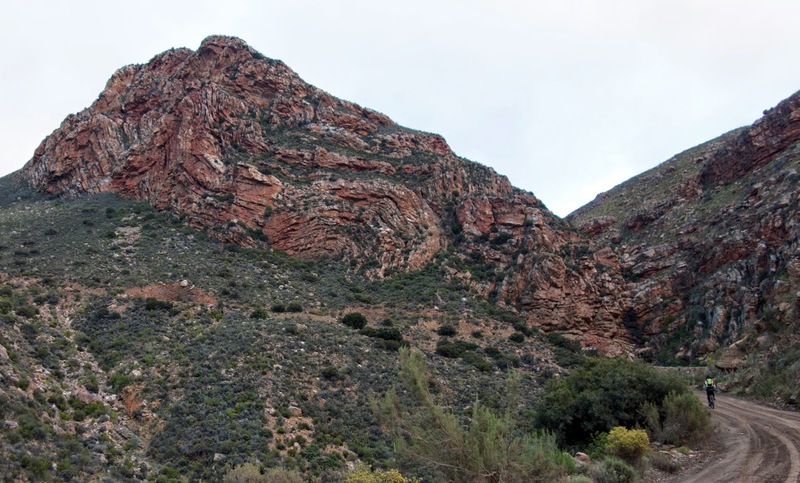 Legend has it that Gamkaskloof was discovered when farmers lost their cattle and followed their tracks into the valley. There was no easy way to get their cattle out, so they decided to settle there. 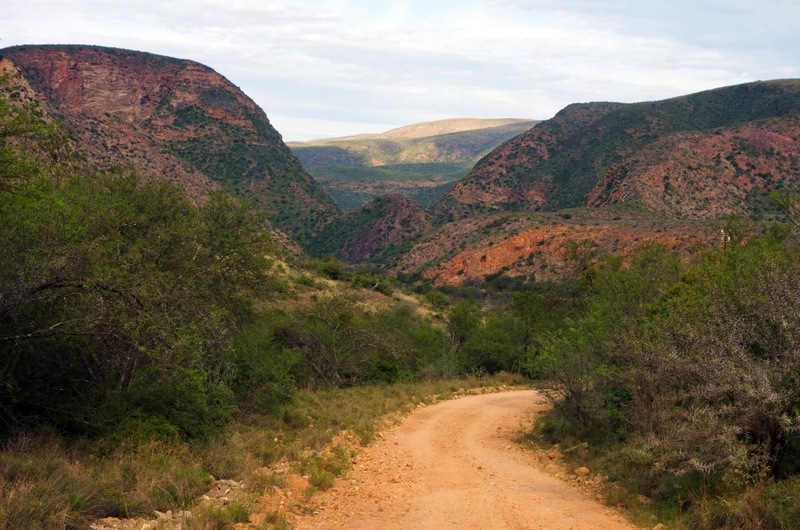 Today Gamkaskloof is a nature preserve and still occupied by a lucky few. 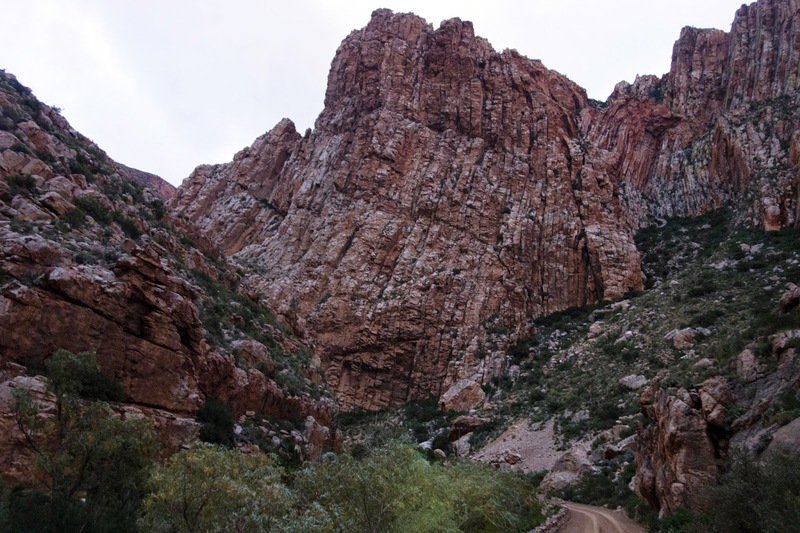 Sure, they have a long way to drive to the grocery store — but what a location. 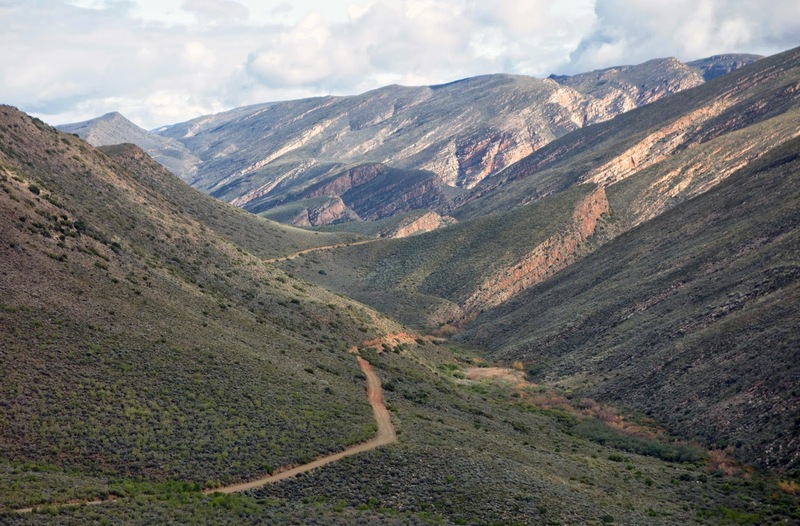 Gamkaskloof is also referred to as "Die Hel" — "The Hell." 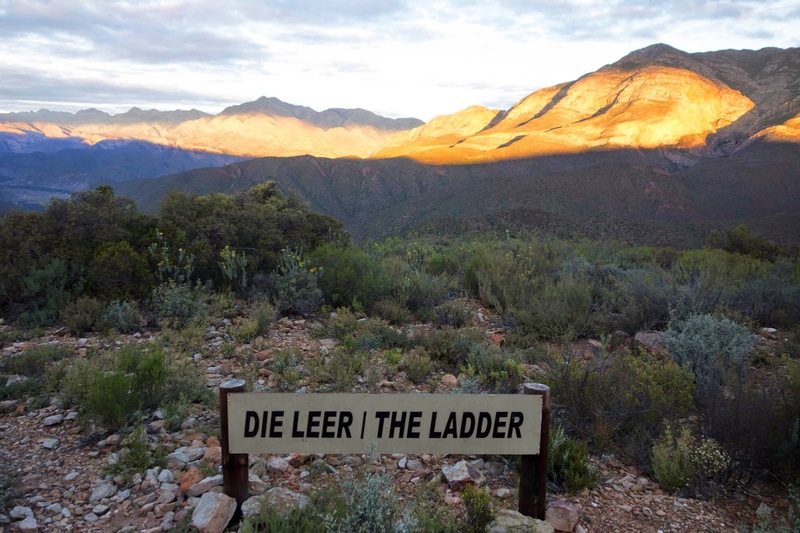 No one really knows why, although legend has it that an animal inspector went into the valley in the 1940s, before the road was built, using a route known as "Die Leer" — "The Ladder." He described the experience as "Hell." This would be our way out. Really, what I have here again is more pictures than story. 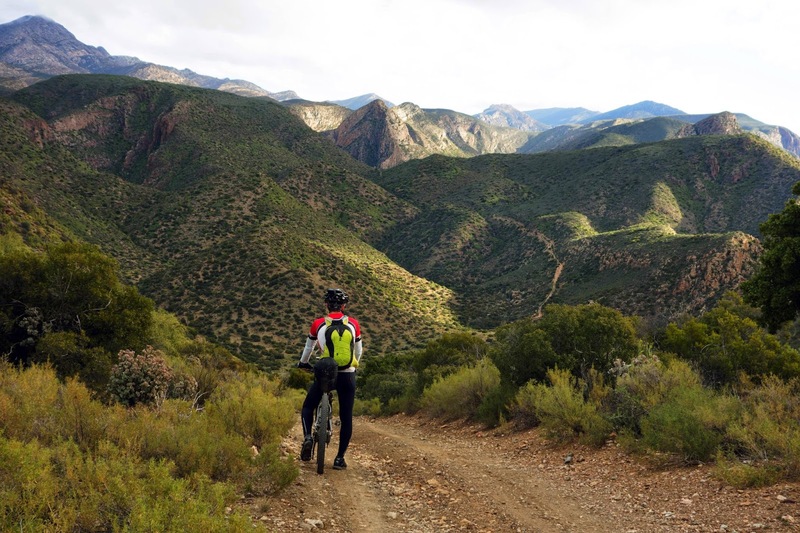 There are only so many ways you can say "this section was beautiful and fun." But I couldn't easily pick which photos to cull. Liehann looking into "The Hell." Yeah, I know. Quite hellish. We had a quick lunch in the tiny village and set out to find The Ladder. A steep climb brought us to the corner of this isolated valley. In front of us was a wall, and it looked insurmountable. I mean, it really did look like a cliff. "That looks super technical," I said nervously. "I don't know about this." Fear started to creep back in. Liehann assured me all would be fine. We picked out the poplar trees listed in our cues. "As you go behind the trees you will experience a moment of magic. In the metre-wide gap between the poplar trees and the face of the mountain there is a a foot path. You are now on The Ladder." And indeed, behind the poplar trees, we caught our first glimpse of the zig-zagging path up the face of the cliff. It wasn't quite a moment of magic — but it was reassuring. The Ladder is in fact a well-built trail, although very steep, with stair-like boulders lined by thick brush. My arms still weren't well-recovered, and my muscles balked at even meager efforts. I tried to hoist the bike on my back, but I couldn't quite position it correctly. My method of walking with the saddle hooked over my shoulder didn't work on a trail this steep. I resorted to lifting the bike up and placing it down on a ledge, crawling up myself, repeat. It was extremely slow. My arm muscles started to fail again. I dropped the bike once, and teetered enough to feel unnerved. I made more efforts to hoist the bike on my back. "It really shouldn't be that hard," I thought to myself. "What's the deal?" I looked up to see Liehann far ahead. Eventually he came back down to help me. "I'm sorry I'm so slow," I apologized. "I really don't know what's wrong with me." I thanked him repeatedly as he carried my anchor part way up the mountain after hauling his own. "It's for my benefit as well," Liehann said. I agreed. "Yeah, it would probably take me all night to scale this wall alone. And you'd have to wait for me." As it was, the sun was setting by the time both bikes reached the top. 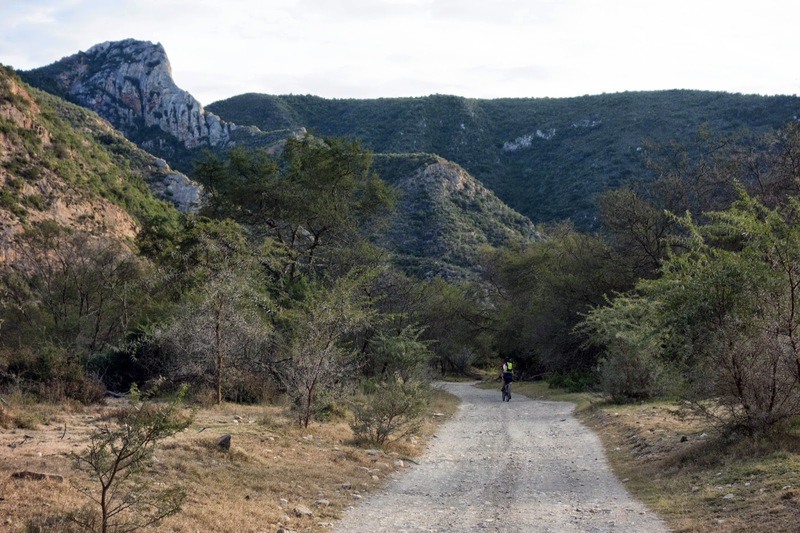 We still had ten more kilometers on a faint track overgrown with tall brush — and just steep and rocky enough that we could only intermittently ride. 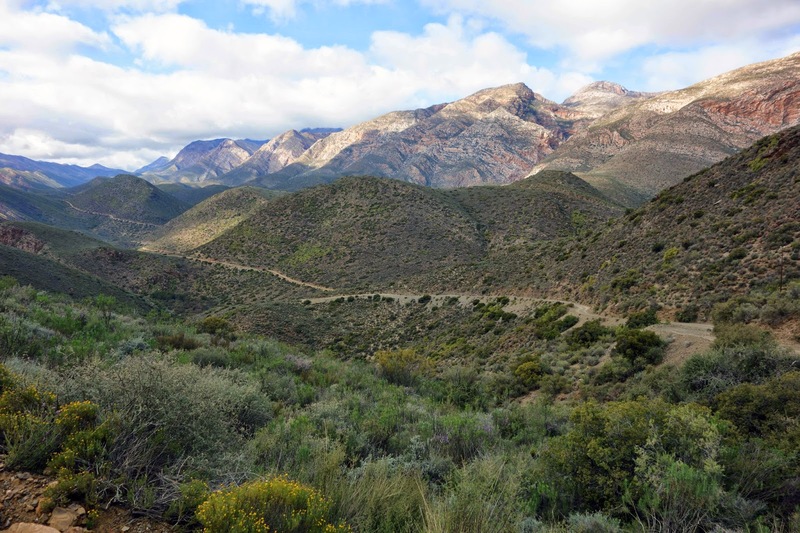 At the end of that track, there were still 40 more kilometers of often steep, rolling roads into our destination, for another 130-kilometer day that included this two-hour hike. Long days. And I admit I was feeling deflated by my inability to conquer The Ladder on my own. Still, the beauty of this place eclipsed the hard efforts, making every hour worth it. I don't think you need to steer clear of fears at all. Navigation is a crucial part of this challenge, and long may it stay that way - GPS has been batted away whenever it gets looked at as an option. The race includes maps and a narrative description of the route. The maps are obvious, but the story behind the narrative is quite interesting*. 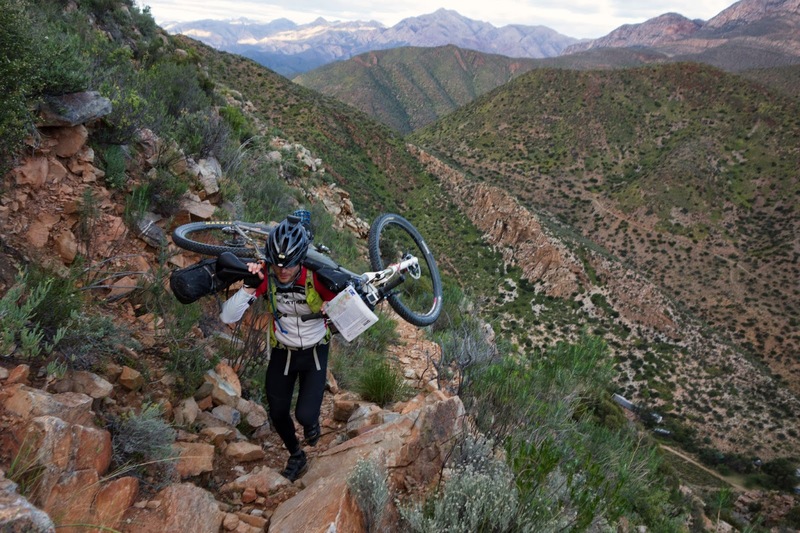 Xolani Mtshali did the race in 2006, he was in his early 20s and not really a mtb rider - nor could he read maps. Once he got separated from his group, he needed some help by sms from David Waddilove. Those sms became the narrative, mostly done by memory. They are much better now, having gone through a few iterations and testing(as have the maps). I had no idea Africa is that beautiful. I'm so glad you took the time to take the photos. This is an amazing story. Thanks. Beat/TJAK hasn't done anything similar with the maps and narratives from David - trust all Freedom Challengers, it's nerve-wracking not knowing where you are, when you're hungry, tired and the sun is setting... even for us Saffers in our own country. Thanks for the blog, absolutely love it. And I should clarify. Beat wasn't criticizing me or Liehann. He was just surprised at some of the tone of my race report, because when he talked to me during the race I was always upbeat and positive, and only mentioned the navigation was stressing me out sometimes in passing. "Hey Jill, see that rock, the long grey one, just there, a little to the right." "It looks like an elephant." Gamkaskloof was probably my favorite day, if you can have such a thing. 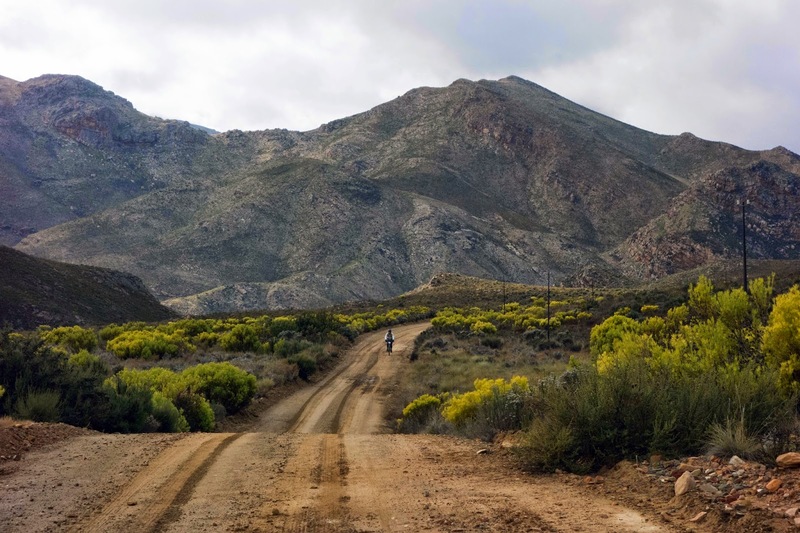 I'd missed out on it previously, and Swartberg Pass, The Hell, and The Ladder lived up to high expectations. I had built them up so much in anticipation I was actually worried I'd be let down, but fortunately not. Jill, I had been wondering if you would be willing to tackle The Ladder after lunch and was thinking about how to convince you after the descent into the valley. In the end it wasn't even a discussion - we just continued - thanks for that. Steve - I loved the "moment of magic" comment. It describes it perfectly. Even seeing the route from a distance where you can see the first few switchbacks you have no idea how to get up there. I also found it humerous how despite all the extra effort they were putting in, for a couple of days we kept running into Marnitz and Graham. Especially seeing Martinz on the couch at Dennehof sipping a glass of wine. To be fair those days we were riding to our strengths and I think Glen's departure from the race dropped some of the urgency. After Dennehof we didn't see them again though and they finished the last few days in at most half the time we did. I feel like there must be more to say about the ride to Prince Albert but I can't think of anything. 14 hours of riding blend into a single memory of one long straight road and an incessant head wind. The last 20km, when you can see the lights, look and feel downhill (which David later confirmed is), but even then we couldn't stop pedaling. No freewheeling! We had one turn of about 7km with a tail wind, right near the start of the day, and I remember clearly thinking, "this isn't going to last, enjoy it while you can!". Really enjoying the report. I don't think you need to worry too much about it coming across too dark or negative. Anyone who has even a passing interest in such endurance events knows that part of the attraction is the interplay of struggle and reward. 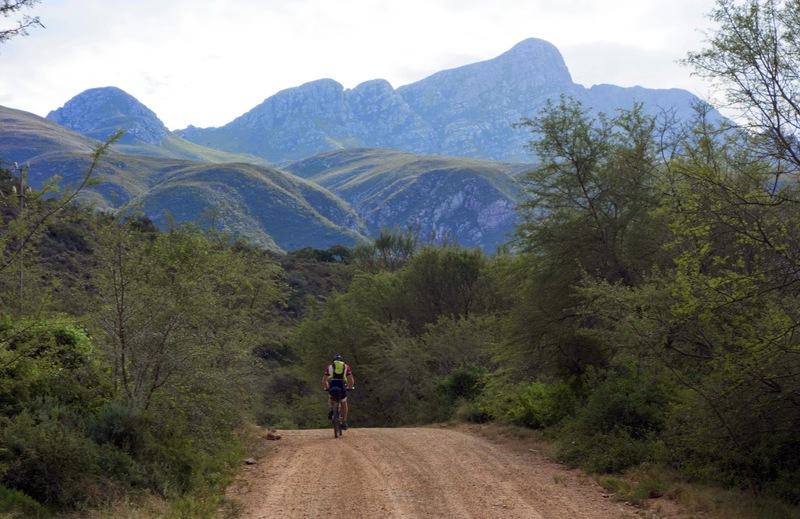 There really is nothing more boring than a race report that is merely a description of the route and the events that transpired while traversing it. If you weren't there, no amount of details is really going to describe what it was like. To me, sharing the internal narrative really is the point of telling the story. I find it fascinating reading of your struggles to manage your fears in these events. I think that you and I are quite different personalities in this respect and its interesting to get a glimpse of a different mind set. If anything, I fail on the side of not having enough fear even when I probably should. It's one of the reasons I quit rock climbing and avoided getting into any sort of mountaineering. I know myself too well and realize that my tolerance for risk may occasionally go beyond the objective reality of the situation. I guess you could say that I'm sometimes uselessly strong and stupidly brave. I just can't get over this entire adventure, Jill. What a nutty experience! And so hard! But also, obviously, so amazing too. Great photos as always. Great post, Jill. Especially your first graph. "There were many relaxing and enjoyable moments that tend to fade in the wash of memory"
I love the fact that this line comes right under a photo of Liehann carrying a bike on his shoulders over a rocky trail. That made me laugh! "I'm not brave, and I'm not strong ... but I'd like to be. So what do I do about it? I face my fears." To me, facing your fears = bravery. You're brave, Jill. Strong, too. Incredible photos. What a beautiful place! P.S. Did you guys ride with flats or clip less pedals? Jill always rides flats (even on roadbike), Liehann clipless. I used to ride clipless because I was following the cargo cult, but switched happily to flats. You don't lose nearly as much efficiency as one might think, if any (at our level). 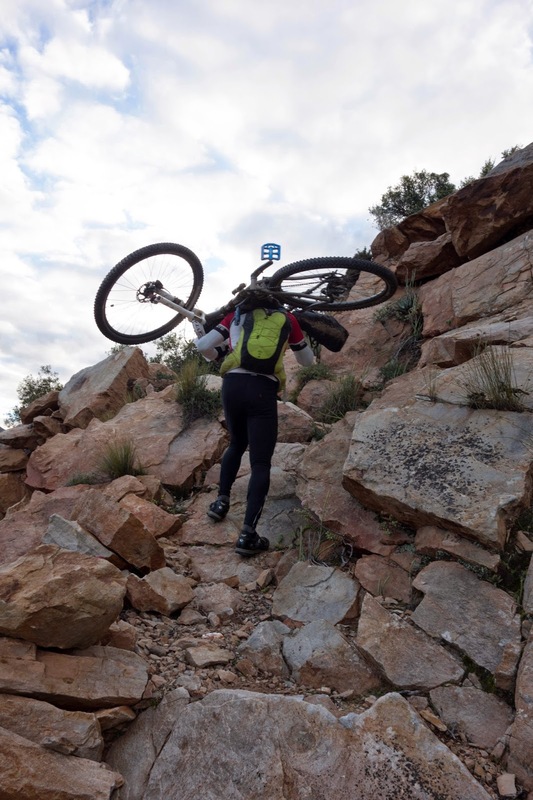 What you do lose is some bike control (though very technical riding can be done by some excellent riders on flats just fine, and you can hop off a lot easier on flats:), and shins when pushing (I have an idea for that). Jills (and my) main motivation is foot pain and numbness in hard clipless shoes, and you just have a lot more foot position options on flats to address knee issues, you have much warmer feet, and you can wear good shoes for walking. Thanks, Beat. I switched to clipless pedal just last year and love them for the technical stuff (especially technical uphills). And they're making good MTB shoes that have good grip and flexibility for hike-a-bike. But flats have their advantages, as you've pointed out. I may get a pair and start switching back and forth depending on the circumstances. I used Shimano SH-MT91 three quater boots with cleats for clipless pedals and they were perfect. The cleats are level with the sole so that one can easily walk with them. I have seen a number of guys with shoes that look like normal "running" shoes, but they have inset cleats and they also worked fine. My riding partner used ordinary MTB shoes and he coped pretty well. Yeah we've tried a number of bike shoes. They do need to have stiffer soles than running shoes given the smaller platform of a clipless compared to a big platform pedal. Both Jill and I have some nerve damage in our feet - frostbite and too much running - and are pretty sensitive. the stiffness I believe has something to do with the problems we have. So we keep coming back to flats anyways. I used spd pedals but the trail ones that have a cage around the clip. I combined these with Pear Izumi X-Alp Enduro IIIs, soft sole hike-a-bike shoes. The soles were too soft on regular pedals but worked very well with the extra platform. Mostly for hiking they were fine but here and there you stand on the cleat which can be a bit slippery. Relaxing and enjoyable moments always tend to fade away, but the struggles and sharp edges will be cast in you soul and will always be part of your memory to be spoken about for many years to come. Be brave, be strong !! The comments are *almost* as good as the report! Great wisdom here! Very much enjoying this report and your writing. Ok I gotta clarify a little: I didn't tell Jill to do anything in her blog particularly. We simply discussed her experience, and I mentioned how it seems more stressful to her in hindsight that I got the impression from talking to her during the race, which, for me, usually is the other way around. I wanted to understand how she felt about it, and why, and how she processes the experience of facing her fears, and what it did for her, and if this was a worse experience than for example her first Iditarod or not, and why so. The more concrete reason for discussing this is that I signed up for the FC next year, and at this point Jill isn't up for it again at this point, whereas Liehann basically (and probably literally) peed his pants in excitement (especially since he got the ok from his girlfriend to do this again so soon if I go). Obviously Jill can do what she wants and I'm supportive of whatever she does, I just wanted to see why she wouldn't want to go back there, whereas she did go back to the ITI (she also doesn't want to go back to the PTL, and while I believe she could physically do it, I'm pretty happy about that, since it's a truly dangerous event, particularly if you don't have an extremely good team, and she had a really bad experience). Might just be too early to ask. 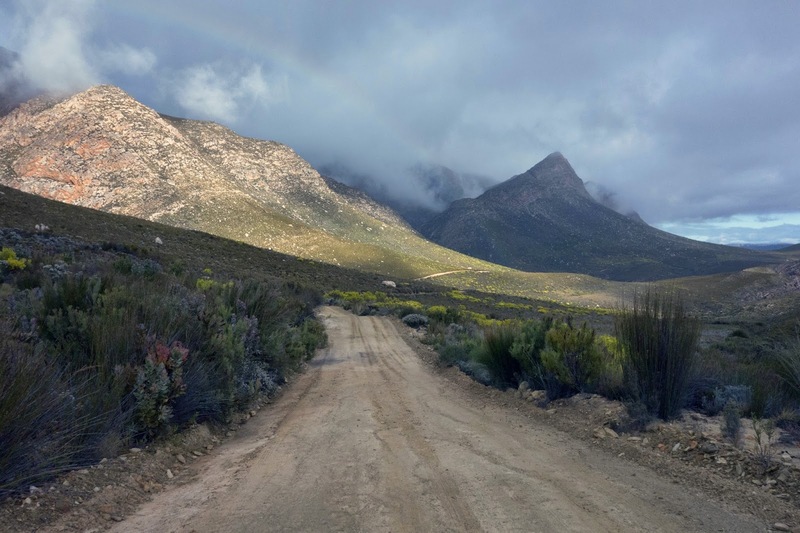 Jill, for me who has recci'd the route from Kleinpoort once and from Prince Albert twice, your account is a wonderful read. I now have more respect for George Weinekus and myself for navigating the Osseberg on our own, even though we had to sleep a night at the foot of the actual Osseberg mountain. You can read our account by Googling One Giant Challenge. Shame on whoever was responsible for having the course where there are no apparent paths and sent people into dangerous and overgrown areas! Putting people's lives in danger! They must have had a good waiver so they would not be responsible! Making people climb over 9 feet high fences with their bikes! Tom, you clearly have no understanding of what true adventure is. Someone said something along the lines of "Without the possibility of death there is no true adventure". While this may be true of climbing Everest (which I assume you disapprove of) it is a small but real risk on the Freedom Challenge and one of the reasons I come back and ride it every year. Thanks everyone for weighing in. I look forward to checking out the other race reports. Tom — people who sign up for this race know those things going into it. I suppose it's my fault that I didn't anticipate the 9-foot game fences. But that's the game. You can always turn around if you truly feel it's unsafe. Beat has asked me about riding the Freedom Challenge again, and so far my interest still reaches elsewhere. It's difficult for me to build up excitement for doing the same thing twice — the glaring exception being, of course, the Alaska races. I'm not sure what it is about those — I guess it's true that some things just get into your blood. 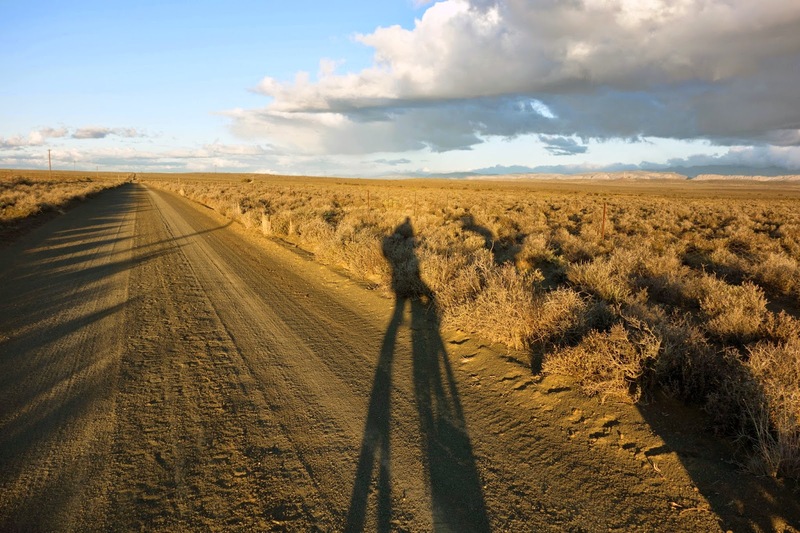 I've toyed with the idea of riding the Tour Divide again, but so far haven't been able to muster the same enthusiasm even for that. Time will tell. 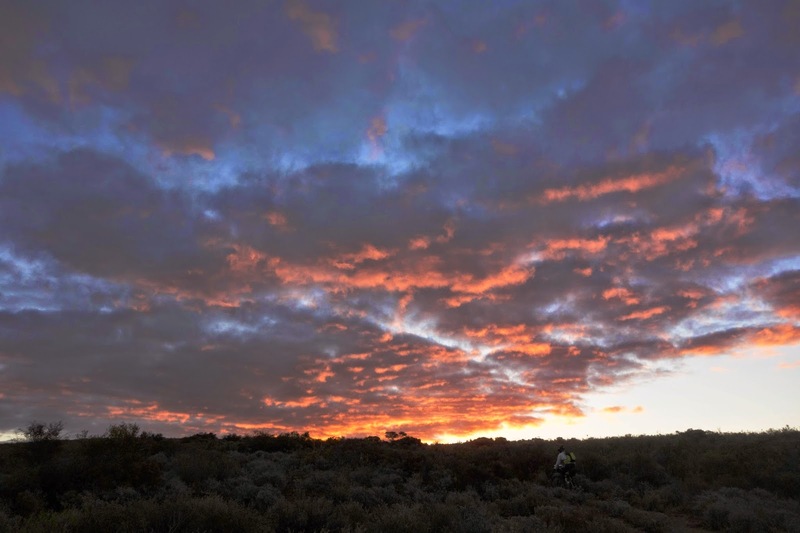 For the virtual rider here, these reports as always by Jill are awe inspiring and highly entertaining and informative. Having spent some time in S. Africa, I'm now longing for a return visit. Jill, I am enthralled by the photos! 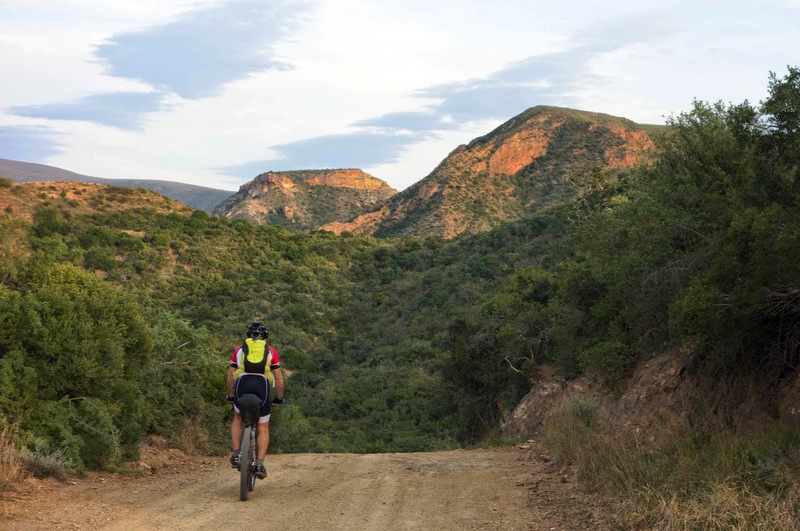 I rode the Cape Argus Cycle Tour on nice paved roads with 36,000 friends and it was beautiful, but what you saw out in the bush is stunning. Thanks for including so many pictures as you told your story. Now I'm waiting for the BOOK. I agree with Eric--you are brave--very brave. Bravery isn't a lack of fear. Someone without fear is probably oblivious and their survival may be questionable. Concerning the tall gates: Are they locked with keyed padlocks? If so, it might be worthwhile to learn lock picking so they could be opened and re-closed--if allowed. I'm green with envy. Keep moving, Jill. You're an inspiration!